Sheep export images that triggered the Emanuel investigation. AUSTRALIA’S largest live sheep exporter, Emanuel Exports, has lost its livestock export licence. The licence has been cancelled following a thorough investigation and show cause process, the Department of Agriculture and Water Resources said today. However, the department said it was ready to consider applications from exporters that meet the animal health and welfare standards required by legislation. 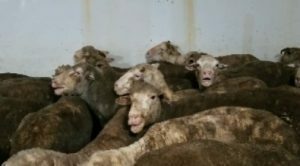 The investigation into the Western Australian-based company was triggered by the release of video footage by Animals Australia earlier this year showing dead and dying sheep in cramped overheated conditions on Middle East shipments organised by Emanuels, including on the Awassi Express, on which about 2400 sheep died during a voyage in August 2017. The footage prompted community outrage, government investigations, new loading density and independent observer rules, legislation to introduce higher penalties for animal welfare infringements and other bills to phase out the Middle East northern summer trade. Emanuel Exports’ licence was suspended on June 22 and three weeks later the licence of a subsidiary, EMS Rural Exports, was also suspended, leaving about 45,000 sheep in a feedlot south of Perth in Western Australia awaiting export. Many of the sheep have since been sold to WA processors while the company considered its options. The departmental statement today said its decision was made in accordance with the requirements of the Australian Meat and Livestock Industry Act 1997, and has been taken action against the company in the best interests of the industry and for the protection of Australia’s high standards of animal welfare and health. It is the responsibility of each exporter to ensure it meets the clear requirements under the legislation that governs the export of livestock, the statement said. These are set out in section 23 of the Act. “Importantly, this includes providing complete, accurate information to the regulator as to how regulatory standards and licence conditions will be met and have been met. “Cancellation of licence is a serious step and is not one taken lightly. The Australian Government supports a sustainable livestock trade and expects exporters to meet their animal health and welfare responsibilities, the department said. The department is implementing a series of changes to improve the sustainability of the trade with improved animal welfare outcomes. This includes those changes recommended by Dr Michael McCarthy in his review of the conditions for the export of sheep to the Middle East during the northern hemisphere summer. The department will not provide further comment on this matter at this stage. Click here to read a copy of the relevant provisions of the Act that underpin the department’s decision.